Nobody would speak about it. Nobody would admit it. The Bucs brought more than The Rock - their tangible Jon Gruden-led inspiration for chiseled determination - to the Louisiana Superdome on Sunday night. They also brought The Cushion. Breathing room can be a dangerous thing. The Bucs were feeling good about things. Maybe too good. They had a four- game winning streak. They had beaten the Packers before a delirious home crowd. They had the NFL's best record. For one of the few times in franchise history, they seemed in control of everything. Everything! My goodness, people were planning Super Bowl trips, a look-ahead prospect that made Gruden smirk. But you couldn't deny the feeling. The Bucs had big, big things ahead. As it turned out, the Bucs weren't in control of much at all. Except this: December is going to be one wild month. They actually had plenty to fear, including a force that can't be underestimated in today's NFL. Desperation. New Orleans desperation. If you're looking for a bottom line, that's why the New Orleans Saints beat the Bucs 23-20. One more loss and the Saints could forget winning the division title. One more loss and they were fighting just to secure their No. 6-seeded playoff spot. Now they have life. The Bucs should learn from this. Beginning next Sunday at Raymond James Stadium, they better play like a desperate team. Or else things could get really dicey. The Bucs, who last week had everything in their hands, still lead the NFC South. By a half-game. A sliver. Or roughly the same amount of opening that Michael Vick requires to sprint 50 yards. The Bucs (9-3) get the Atlanta Falcons (8-3-1), the NFL's most scorchingly compelling team, at home next Sunday. Even if that challenge is answered, that's only part of the two-pronged problem. The Saints (8-4), who would've been ruined as division hopefuls, are now only a game back. More importantly, they now hold two victories against the Bucs. If the Saints and Bucs finish in a tie for the NFC South title, the Saints are champions. The Bucs are wild cards and hitting the playoff road - again. There's this little nugget as well. The Bucs, Packers and Philadelphia Eagles now share the NFC's best record. Right now, the Eagles control home-field advantage throughout the playoffs. The Eagles. Just what you didn't want to hear. The Bucs got a little feisty toward the end, driving 84 yards on 17 plays to draw close. The Bucs went 3-for-3 on fourth- down conversions in the drive, finally drawing closer on Brad Johnson's fourth- and-goal touchdown to Keenan McCardell, then the two-point conversion pass to Keyshawn Johnson. It was 23-20 with 2:49 remaining. Plenty of time for Tampa Bay's top-ranked defense to make a stop, then position itself for a potential overtime-forcing field goal. The Saints had third-and-8. Quarterback Aaron Brooks, with an injured shoulder, had his pads off. Jake Delhomme, the rusty replacement who had thrown one pass all season, then completed a pass to a diving Joe Horn, just beyond the yard marker. Jake Delhomme? First down. Game over. Too little, too late. But to pin the blame, you need to look much earlier. The Bucs had no running game. They barely tried to establish one. Michael Pittman and Mike Alstott each carried eight times for a combined 34 yards and a 2.1-yard average - one of the worst running efforts in Tampa Bay history. Brad Johnson, who had been extremely efficient during Tampa Bay's five-game winning streak, worked under extreme pressure and was sacked four times. Still, he completed 28 of 44 for 276 dink-and- dunk yards. The lasting memory? His ill-advised fourth-quarter interception on first-and-10 from the Tampa Bay 28-yard line, which set up John Carney's tack-on 48-yard field goal. You can't pin this loss on Tampa Bay's defense, which surrendered just 238 total yards (a winning effort). 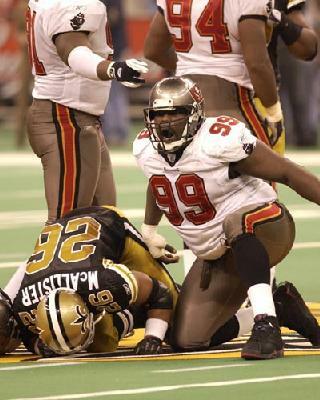 The Bucs defense had four sacks, including three in the first quarter by Simeon Rice. When it really mattered, though, Brooks had enough time to throw. Tampa Bay's special teams were largely a disaster. Saints punt returner Michael Lewis raced 56 yards in the third quarter, setting up Brooks' 14-yard touchdown pass to Horn that made it 20-9. Tampa Bay's Aaron Stecker had fumbled an earlier kickoff return. Martin Gramatica boinked a 42-yard field goal attempt off the right upright. Some things went right, notably the performances of McCardell (11 receptions for 107 yards) and Rice, but not nearly enough. So now it's back to the brink. The breathing room is history. Now it's back to some urgency. Atlanta at Tampa Bay, next Sunday at the Ray- Jay. The Rock will be there. The Cushion better be a long-lost memory - or else.